At the national Local Authority Building Control (LABC) Conference, the Department for Local Government (DCLG) announced that the new Building Regulations were to be rubber-stamped by the Queen this week, coming into effect shortly afterwards. The move is part of the Coalition Government’s implementation of deregulation that will see the Code for Sustainable Homes, amongst others, absorbed into the Statutory Instrument of Building Regulations. During the conference, the Practice discussed the need to incorporate flood-resilient guidance and Buildings Regulations for floating domestic structures that are currently absent – perhaps in a new Part W or a subsection within the current statutory instrument. 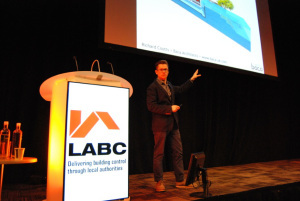 Talks by LABC’s Rob Burridge (Warranty) highlighted some points to reduce latent defects in buildings for Designers, Engineers and Inspectors, with Richard Twine’s review of the new standards serving as a good wake-up call for the new changes that will arrive this April.